Spices are fantastic for adding taste to our meals. That’s not all. Spices also have many health benefits. Including spices in your diet is an easy way to boost your health. As the temperature drops, drinking warming teas is the perfect way to feel warm and comforted. Warming teas also add fire energy to help sluggish digestion. 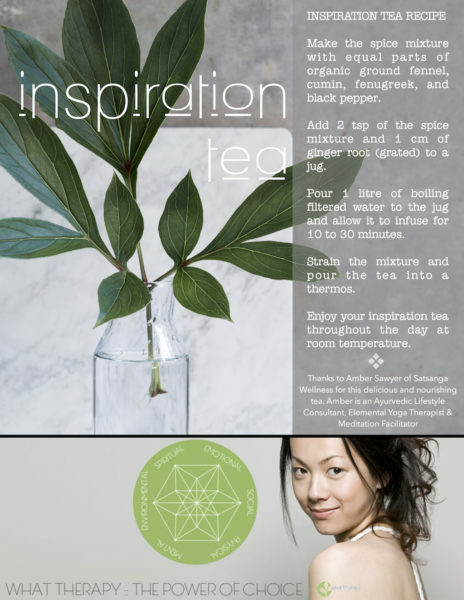 Amber Sawyer of Satsanga Wellness always serves this beautiful tea at her gatherings. We asked if she would share it with us and so here’s her delicious recipe using just four spices, plus ginger root to zing it up. Amber is a Meditation Facilitator, Elemental Yoga Therapist, and Ayurvedic Lifestyle Consultant so we know she can deliver her goods! Known for its antioxidants and anti-inflammatory properties, ginger is used in a variety of ways, especially well-known as a natural remedy for motion and morning sickness. People also use it to lessen the nausea associated with chemotherapy. Ginger also contains gingerol, a therapeutic compound. Ginger is commonly used in Chinese cooking and is considered a superfood for digestion, respiration, and joint health in Ayurveda. As many people are familiar, ginger is warming. It kindles our digestive fire, improving also circulation which can provide relief from cold for vata and kapha constitutions. Anthony William, in Life-Changing Foods, writes that ginger is the “ultimate antispasmodic” – from its 60+ trace minerals. Rather than acting as a nerve tonic, ginger is a tonic for the organs and muscles, “telling the body that it can let go, that everything is under control.” This makes ginger a natural remedy for stress. The herb Cuminum cyminum is part of the parsley family and is a traditional medicinal and culinary plant in different cultures. According to Ayurvedic principles, cumin is considered bitter and it balances all three doshas – vata, pitta, and kapha as well as improving digestion and detoxification. It also has antioxidant, anti-inflammatory, and anti-microbial properties. Cumin is a potent free radical scavenger. Probably the most used spice, Black Pepper enhances the taste of any food. Not only does it improve the absorption of nutrients by making the food’s nutrients more bioavailable, Black Pepper supports digestion of protein and the secretion of hydrochloric acid. In Ayurveda, Black Pepper is believed to be cleansing on the intestines. Black Pepper also supports detoxification by promoting sweating and by improving liver function due to its cleansing effect. Fennel is used in the culinary arts as well as medicine. It is a member of the Umbelliferae family and is related to cumin, carrot, and coriander. A perennial herb, Fennel is full of nutrients and is well-known as a digestive support, relieving bloating, gas, and heartburn. This makes fennel a great natural antacid. Its cooling properties makes fennel a good digestion aid in Ayurveda, while balancing all three doshas. Fennel’s other health benefits include lowering blood pressure, relieving colic in babies, improving eye health, and healing respiratory infections. In Ayurveda, fenugreek balances vata and kapha. This is a warming nourishing herb that is also very grounding. Great for digestion due to its high fibre content, fenugreek also has a positive effect on energy levels and sexual arousal. It is used to increase breastmilk and supports women’s reproductive health, though it should be avoided by pregnant women. Make the Spice Mixture with equal parts of the herbs. Add 2 teaspoons of the mixture and the ginger root to a jug. Pour 1 litre of boiling filtered water to the jug and allow it to infuse for 10 to 30 minutes. Strain the mixture and pour the tea into a thermos. Drink at room temperature throughout the day. Find out why we call this warming tea Inspiration Tea and why it is great for the autumn and anytime you want to balance your Air Element.